You might wonder what difference you can make in the lives of children half way around the world. It turns out that what you learn in your youth has a profound effect on the rest of your life. Children in Laos need a good foundation for opportunity. SKL provides the means for you to make a difference. Read on about why people like you have chosen to make a difference. I trust School for Kids in Laos and the team behind it. 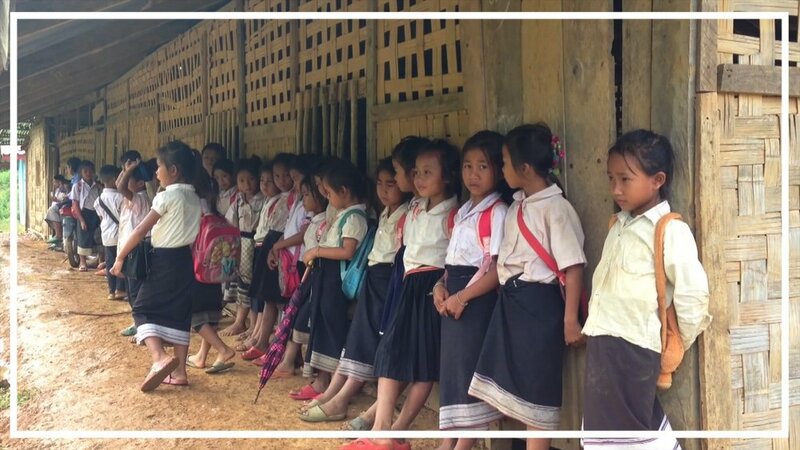 They consistently fulfill their promises to bring hope for a better future to poor children in rural Laos by providing sturdy, safe school facilities. That’s exactly the life changing impact I’m looking for when I make my donations. I speak from experience because I once was in the same situation as those children. I feel very fortunate to have had the opportunity to rebuild my life in the USA. Now that I am secure and living a relatively comfortable life, I want to give back in a way that will make a lifelong impact. As a supporter of School for Kids in Laos, I know that my donations always make such an impact. It makes me feel good knowing that together we can truly make a difference. When we were looking to make a difference in Laos, our research quickly identified the work that SKL was doing. A closer look at SKL revealed an organization that is responsible, accountable, efficient and remarkably effective. When a charity in one part of the world wants to invest in the lives of others in a different part of the world, often much is lost "in translation" and the "social dividend" can be quite diluted. Knowing how SKL is structured and how they work to achieve the goals of improving the lives of children in Laos, we've developed unquestionable trust in SKL's team and confidence that the work we're investing in does indeed translate into a meaningful improvement in the lives of Kids in Laos. Being able to support young people in my native Laos is an absolute pleasure for me. The hard work and opportunities I've enjoyed here in Canada has inspired me to do what I can to help young people in the land where I was born. I've found no better way to achieve this goal than to support the good work that Ken and his team at SKL do. Not only does our Annual Wasabi Golf Tournament help Laotian kids, it's a fun way to do it and involves many who wouldn't otherwise have heard of or cared for these kids. I truly believe every child deserves a good education provided in a safe, effective environment. Often, schools for children from poor families in remote rural areas are less than safe, less than comfortable. I jumped at the chance to help children in Laos, to support their efforts to acquire the skills and knowledge that are critical to their futures and that of their country. It makes me feel good to know that SKL sends every penny of my donation to Laos to build schools. I know my gift is having a really positive impact on these children and their families. I am very touched to see SKL Inc., based in a far away land, secure the support of generous donors from all over the world, then come to Laos to build schools for children in rural regions. I can certainly relate to those children as I came from a modest and humble family. Now I am very fortunate to be a successful entrepreneur and businessman in Laos. I would also like to give back to society, especially those underserved and less fortunate children in the Lao countryside. After all, they are the future of our country. Talia and I spent over two months in Laos in 2012 and absolutely loved it. We taught English to monks in Luang Prabang, saw dragon boating on the Mekong, visited old temples and sights, explored Kong Lor Cave and experienced many more things. We even considered living there for a time. The people of Laos are some of the nicest, most pleasant people we have met and made our time there unforgettable. Because we loved it so much, we wanted to help in any way we could. We knew school supplies would be useful and so searched the Internet, finding School for Kids in Laos. We connected with Thongsay (Ken) and sent off our parcel to Laos. On December 18, at the official opening of the new school in Viengkham, our donation of notebooks, pencils, pens, sharpeners, erasers, scissors, rulers, scotch tape, paper clips, staplers, stickers and art supplies was presented to the students and teachers. Our dream is to live in Laos for a while to aid in the construction of a new school. SKL is doing a wonderful job and we want to do more to help. In 2010, my family and I came across SKL's website while searching for charities making a significant impact in Laos. Having travelled there a couple of times to visit family, we were conscious of the suffering faced by millions of Lao who, like the poorest around the world, subsist on less than a dollar a day. Laos' extreme poverty doesn't capture headlines like the latest geopolitical hotspots so it is often forgotten by major charities looking for more high profile causes. Yet the scale of the problems and solutions in Laos are within reach for a small NGO like SKL... a $100, $1,000 or $100,000 goes a lot further in Laos than in many other countries. Right from our first inquiry we valued the transparency and availability of the leadership. We were especially impressed that not only did they welcome us to visit their projects, they didn't mind us going on our own and speaking directly with the villagers, the students and the school staff. This is a charity where you don't need to take anyone else's word about the impact being made. You can ask yourself. SKL brings hope for a better future. Even basic literacy and numeracy open doors to micro-enterprise opportunities and dreams of higher education. SKL is continually improving their strategies to maximize impact and cost effectiveness. Villages are carefully selected by a 360 degree assessment of demographics, geography, logistics, local commitment and more. Villagers are expected to contribute labour and materials according to their ability so that they share a sense of pride and accomplishment. Above all, no other NGO we considered supporting made the dollars stretch as far as SKL does. I adore children! Kids are the most precious thing in our lives. They are the next generations. I spent my entire teaching career with children. I can confirm how much they need to be encouraged, guided and supported in a more inductive learning environment. For those reasons, SKL school building projects fit well with my vision. This non-profit humanitarian organization has my moral and financial support. I believe that if more of us contribute to this initiative, then more young girls and boys in rural regions of Laos will have a chance to attend a secure and safe learning environment. While we recognized the eagerness of children to learn, develop new skills and pursue schooling in Laos, our organization Monde par la main / Give a Hand decided in 2012-2013 to participate in one of the projects of School for Kids Laos. The construction of a school in Ban Pakxoun was a major event in the lives of these children and our organization was proud to be part of it with SKL. For Monde par la main / Give a Hand providing access to quality education is a major step in contributing to a better future. I was not born and raised in Laos, but I still think of it as my homeland. My parents grew up, fell in love, married, and raised my five older siblings in Luang Prabang. 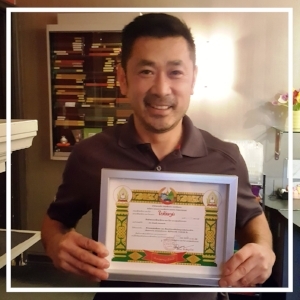 During the war, they made the difficult decision to relocate to Vancouver, British Columbia, where they worked hard to teach us about Laotian food and traditions. My wife and I recently travelled to Luang Prabang, visiting many of its villages and meeting locals. We also donated money to provide books for children without access to schools or libraries. When we heard about SKL's mission to build schools in outlying areas in Laos, we felt it was a cause that mirrored our values and allowed us to support my family's culture. We look forward to visiting one of SKL's schools on our next visit. We both work in education and have educated our two girls so that they have the best possible opportunities in life. Education is especially important to children living in rural Laos - the future of their country is in their hands. By donating to SKL, we know we are helping to make a difference in their lives and to the health and wellbeing of Laos as a country.